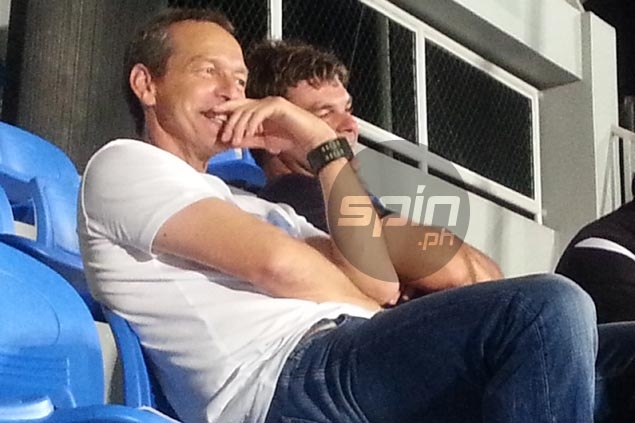 IT seems it’s not only Stephan Schrock and Dennis Cagara who has a beef with Azkals coach Thomas Dooley. The German-American mentor has answered accusations made by Filipino-British goalkeeper Neil Etheridge, who felt he was “disrespected” for likewise not being called up for the Peace Cup training squad, like Cagara. Roland Muller, Patrick Deyto, Nick O’Donnell, and Paolo Pascual were the four goalkeepers listed in the provisional lineup submitted by the national coach, leaving out Etheridge who has long been the first-choice 'keepers during the time of former Azkals coach Michael Weiss. “Never think I have felt so disrespected in my life… few occasions but this is up there. Kick a man while he’s down,” the 24-year-old booter said last week on a Twitter post he later deleted. But Dooley feels it’s the other way around. “I think he was disrespectful by saying something in social media,” the German-American said on Thursday. Etheridge hardly saw action as the third-choice ‘keeper at Fulham in the English Premier League last season, and even for third-tier side Crewe Alexandra where he was sent on loan. In contrast, Muller started for second-tier Swiss club Servette FC last season while Deyto played heavily for Green Archers United in the United Football League as the team's top 'keeper. “How many league games did Neil play? Three. His coach in UK said he needs sixty to seventy games to gain experience,” said Dooley, who played professionally in Germany for two decades and also suited up in two World Cups. Dooley also pointed out that Etheridge was also nursing a quadriceps injury during the Challenge Cup.